Dan Parent is an American comic book artist and writer[ best known for his work for Archie Comics. A graduate of The Kubert School, Dan began working for Archie immediately after graduation. His writing of the Love Showdown series from 1994 received widespread attention. Dan has also written and/or illustrated for DC Comics, Marvel Comics, Felix the Cat Productions, Mattel, IDW, Boom, Valiant Comics, Chapterhouse comics and Harpercollins to name a few. Dan is credited with giving Archie Comics a relevance with contemporary artwork and innovative story lines. .One example is a modern, fashion magazine-style revamp of the long-running Betty & Veronica Spectacular. Another example was a 2010 storyline in which Parent wrote the first bi-racial coupling of Archie and Valerie from Josie and the Pussycats. Archie then introduced their first openly gay character, Kevin Keller, in Veronica #202, who was written, drawn and created by Dan. Kevin Keller has become Archie Comic’s most popular character in decades. Kevin Keller was given his own solo book in 2011. Other notable series Dan has worked on are Archie Meets Kiss, Archie Meets Glee and Archie vs. Sharknado! Dan won the 2013 GLAAD award for outstanding comic book ( Kevin Keller) and is also a Harvey Awards nominee. Dan is co- creator of the hit series, DIE KITTY DIE, which was a huge kickstarter success and is now being published by Chapterhouse Comics. 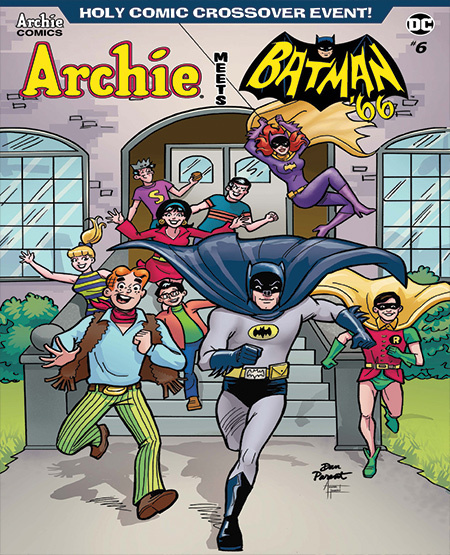 Dan’s current project is handling the art chores on Archie Meets Batman 66, a crossover between DC and Archie Comics.